Superior nutrition for best growth and breeding. Original"Micro Coating"prevents dissolving in water. 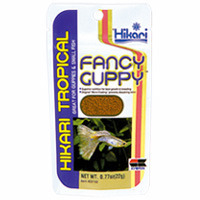 Great for Guppies and Small fish. Bio-Technology helps us create a pellet that becomes soft quickly yet does not dissolve in water. High in palatability,your fish are eager to devour. The multi-vitamins encapsulated within each granule guarantees your pet will get full nutrition we know they need for good health. The "Micro-Coating" eliminates nutrition leaking and water clouding. Linolenic acid promotes growth,health and improves the natural breeding habits of Guppies. Chitosan extracted from crustaceans and iondine derived from seaweed improve the overal condition of your pet.